What's a faster alternative that is just as convenient? http-server for node.js is very convenient, and is a lot faster than Python's SimpleHTTPServer. This is primarily because it uses asynchronous IO for concurrent handling of requests, instead of serialising requests. This will download any required dependencies and install http-server. Path is optional, defaulting to ./public if it exists, otherwise ./. an event-driven networking engine written in Python and licensed under the open source MIT license. conch            A Conch SSH service. dns              A domain name server. Twisted can also utilise security certificates to encrypt the connection. Use this with your existing --path and --port (for plain HTTP) options. go 1.0 includes a http server & util for serving files with a few lines of code. 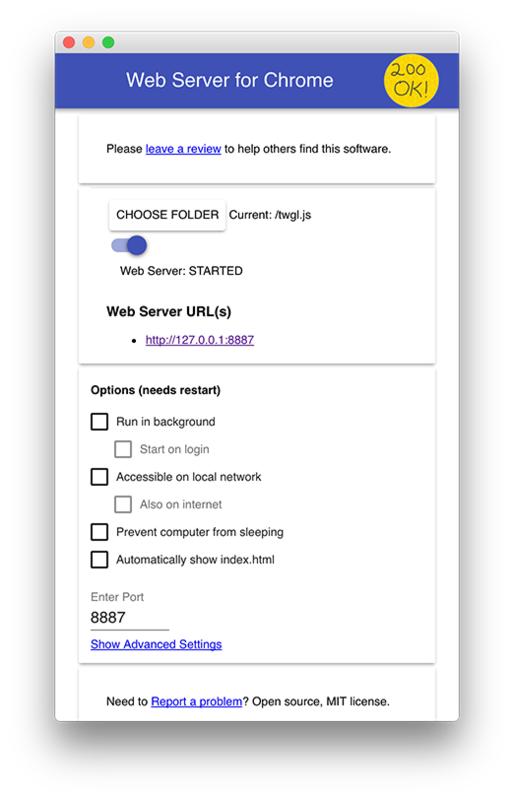 Try webfs, it's tiny and doesn't depend on having a platform like node.js or python installed. Start a local HTTP repository browser and pull server. stderr. Use the "-A" and "-E" options to log to files. Also consider devd a small webserver written in go. Binaries for many platforms are available here. It's small, fast, and provides some interesting optional features like live-reloading when your files change. I found python -m http.server unreliable—some responses would take seconds. I like live-server. It is fast and has a nice live reload feature, which is very convenient during developpement. By default it creates a server with IP 127.0.0.1 and port 8080. And here is a script that automatically grab the IP address of the default interface. It works on macOS only. If you put it in .bash_profile, the live-server command will automatically launch the server with the correct IP. # Echo "No default route found"
Go to http://localhost:8080 or pick "Launch Browser"
Not the answer you're looking for? Browse other questions tagged command-line httpserver command-line-tool simplehttpserver or ask your own question. How to launch html using Chrome at “--allow-file-access-from-files” mode? WebGL - is there an alternative to embedding shaders in HTML? Chrome allow file access from files no longer working (was using to see WebGL/three.js files)? Is it possible to run python SimpleHTTPServer on localhost only? Can I set a header with python's SimpleHTTPServer? Haskell equivalent for python -m http.server?